Albert Einstein first predicted that light travels the same speed everywhere in our universe. The speed of light (in a vacuum) is established at 299,792,458 meters per second. Before Einstein, mass and energy were regarded as separate entities. But with his elegant equation E = mc², Einstein forever changed the way physicists view the universe. In this equation, c is the speed of light, which when squared is a very large number indeed. The equation predicts that nothing with mass can move as fast as light, or faster. For mass to travel at the speed of light would require infinite energy, which is impossible; hence the cosmic speed limit. Without such constraints, photons (and other mass-less particles) can travel at the speed of light, but no faster. In Einstein's famous equation, the Energy of matter (in joules) is calculated by multiplying an object's mass (in kilograms) by the speed of light (in meters per second) squared. So, c² is 8.98755 x 10¹⁶. The first occurrence of 898755 in the decimal digits of pi is followed by the four digits 9595. The first occurrence of this number in pi begins from position 1118, which is the gematria value of the Shema (Deu 4:6). 9595 is the numerical value of the 29,870th verse in the Bible (KJV). The first occurrence of 29870 in pi is preceded by the three digits 888, the numerical value of Ιησους ("Jesus"). 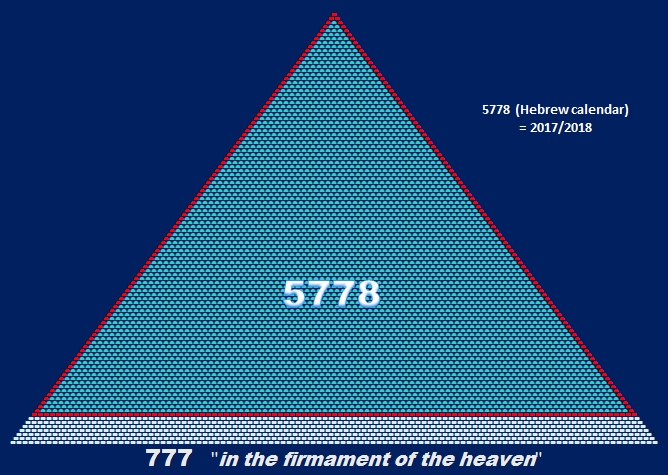 "In the beginning God created (aleph tav) the heaven and the earth:"
The generally untranslated aleph tav has a gematria value of 401, which is the 79th prime number. Remarkably, beginning at position 299,792,458 in pi are the five digits 40179, giving not only the gematria of the aleph tav, but also it's prime number index. The word ואת (vayeth) appears 2251 times in the Bible. The first occurrence of 2251 in pi begins from position 1840. The 1840th verse in the Bible (Exo 12:23) concerns preparation for the Exodus. Israel is to prepare for the coming redemption, and avoid destruction by marking the doorposts of their homes with blood. This event is celebrated as the Passover (Pesach) holiday. These preparations were necessary, as Moses explained to the elders of Israel "for the LORD will pass over the door". Beginning from position 636 in pi are the three digits 960, preceded by 5778. In water, light travels at 75% of it's speed in a vacuum. In a phenomenon first demonstrated by Russian physicist Pavel Cherenkov in 1934, electrons created by water cooled nuclear reactors can travel at speeds faster than light through water. Just as a sonic boom results from an object traveling faster than the speed of sound, a "luminal boom" results when these electrons exceed the speed of light through water. 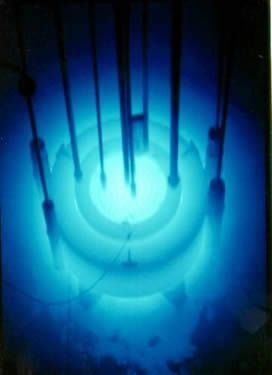 This is called "Cherenkov Radiation" and is usually blue or ultraviolet (see photograph). The cosmic speed limit still applies, however, as matter can never exceed 299,792,458 m/s. Pavel Cherenkov was awarded the Nobel Physics prize in 1958. The Greek version of Aleph Tav, the first and last letters of the alphabet, is Alpha Omega. Four times in Revelation Jesus said he was the Alpha and the Omega, the beginning and the end (Rev 1:8, 1:11, 21:6, 22:13). In the original Greek (Nestle-Aland textform), Alpha Omega is written as αλφα ω, which has a numerical value of 1332. The Aleph Tav (את) appears a total of 7,372 times in Scripture. It's first occurrence is in Gen 1:1, which has a gematria value of 2,701. These two numbers adjoin relatively early in the decimal digits of pi; the sixth occurrence of 2701 is followed by the fifth occurrence of 7372. What is remarkable is that earlier occurrences of each number are followed by the same 6 digits in pi. So 319898 is 31 followed by 9898. 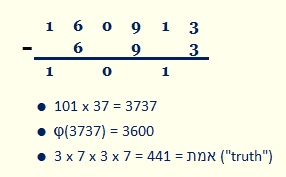 The first occurrence of 15590 in pi begins from position 7277 and is preceded by the three digits 358, which is the gematria value of משיח (Moshiach) translated as "Messiah". Two hundred, threescore and sixteen were the number of souls saved from the shipwreck (Acts 27:37). Clearly, the prevalence of triangular numbers in the Bible demands closer attention. The beast number (666), the number of fish caught in the net (153) and the time the Israelites were in Egypt (210) are also triangular numbers. As is the fast approaching 5778 on the Hebrew calendar. 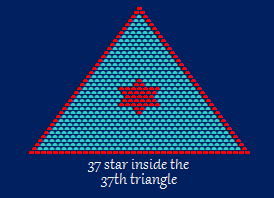 The perimeters of the 153, 210, 276 and 666 triangles are 48, 57, 66 and 105 respectively. 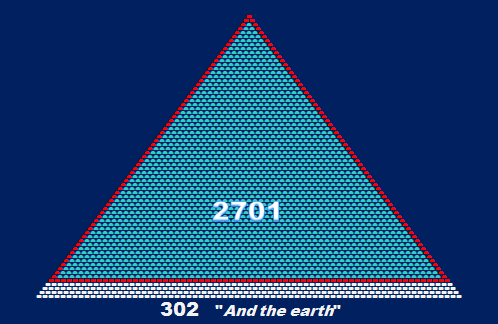 The perimeter of the 276 triangle is 66. In all in the ship were 276 souls (Acts 27:37). 153, 210, 276, 666, 2701 and 5778 are the 17th, 20th, 23rd, 36th, 73rd and 107th triangles respectively. The 276 saved souls (Acts 27:37) and the miraculous catch of 153 fish (John 21:11) are verses 27,893 and 26,910 in the Bible. The Bible's third verse (apt, when discussing triangles) reads "And God said, let there be light: and there was light." The miraculous catch of 153 was the fourth appearance of the resurrected Jesus. His first appearance was to Mary Magdalene (Joh 20:18). In the original Greek, Mary's name is written as μαρια η μαγδαληνη ("Mary the Magdalene"), where Magdalene means "the woman from Magdala". 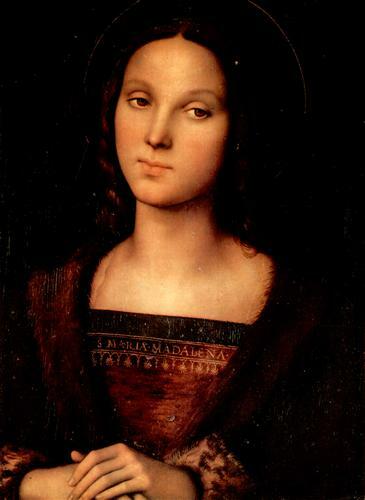 St. Mary Magdalene by Pietro Perugino. Completion date 1500. Jesus' next appearance was to the disciples (Joh 20:22) when he said "Receive ye the holy ghost" (λαβετε πνευμα αγιον). This phrase has a numerical value of 1053. 358 is the gematria value of משיח (Moshiach) translated as "Messiah"
The Israelites were in Egypt for 210 years. The first occurrence of 210 in pi is followed by the four digits 4752. This is the gematria value of the Bible verse relating the 666 talents of gold which came to Solomon in one year (I Ki 10:14). 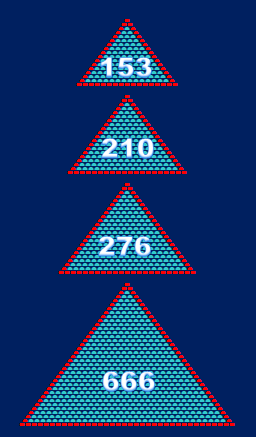 It's interesting that 210 is one of only six triangular numbers which are the product of three consecutive integers (the others are 6, 120, 990, 185136 and 258474216). Going back to the adjoined 2701 and 7372, we can see they are preceded by the number 8883. This numeric string features the 7th, 6th and 5th occurrences of 8883, 2701 and 7372 respectively. We know that 2701 is the gematria value of Gen 1:1, and that the word את (Aleph Tav) occurs 7372 times in Scripture. But what of the 8883? 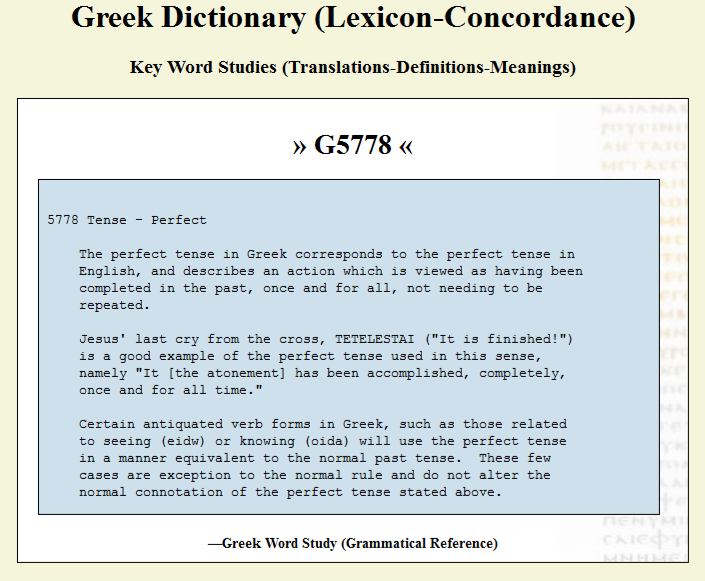 The term "the Father, the Word, and the Holy Ghost" (ο πατηρ ο λογος και το αγιον πνευμα) has a numerical value of 2113, which leads to a remarkable confluence. The average distance from the Sun to the Earth is 149,597,870,700 kilometers (1 astronomical unit or AU). The time it takes for light to travel this distance is 499 seconds (8 min 19 sec). The first occurrence of 499 in pi is preceded by 2113. This string of digits beginning from position 761 in pi can also be read as 4999 followed by 999. This represents the gematria value of the covenant established by God with the newly renamed Abraham, who was then 99 years old (see Gen 17:1-5). Unlike its parallel in Chapter 15 (attributed to the Jahwist), this Chapter 17 (Priestly) account establishes circumcision as the sign of the Abrahamic covenant, and specifies Sarah as the mother of the promised heir. The connection between these two verses invokes the "Aleph Tav" (את), which appears as the second word in the above Hebrew verse. According to Rabbinic law, a Jewish boy is circumcised on the eighth day of his life, which provides further affirmation of the connection between the Bible and the order of digits in pi. Atomic clocks are accurate to within one second in over 200 million years. A second in time is measured as the time it takes for the microwaves that are absorbed or emitted when Cesium 133 atoms switch between states to cycle through 9,192,631,770 oscillations. First demonstrated in June1955 by British physicist Louis Essen, the Cesium clock became the world's official timekeeper in 1967. To 8 decimal places, light travels 3.26122557 cm for each such oscillation. Within this string are the four digits 2255 (the year Jacob died). The first occurrence of 326122557 in pi is followed by the four digits 8777. In a similar manner, the numerical value of the first verse in John's Gospel ("In the beginning...") also forms a base for the Gen 1:1 triangle ("In the beginning..."). The resultant triangle is 112 rows deep. 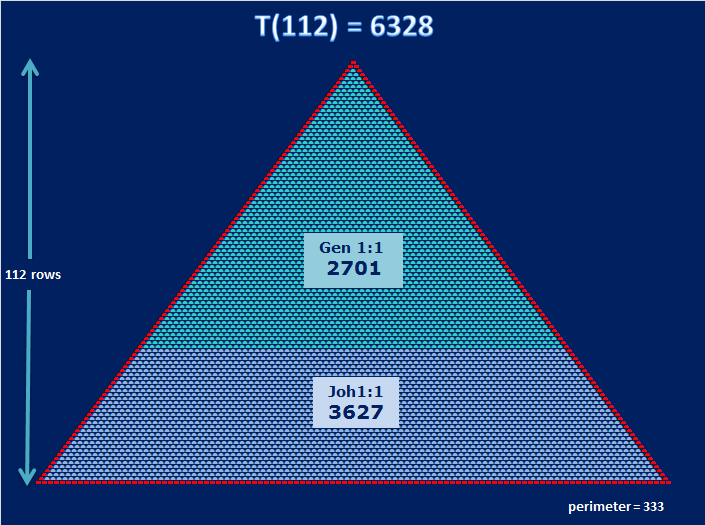 Gen 1:1 ("In the beginning...") and John 1:1 ("In the beginning...") combine to form the 112th triangle. 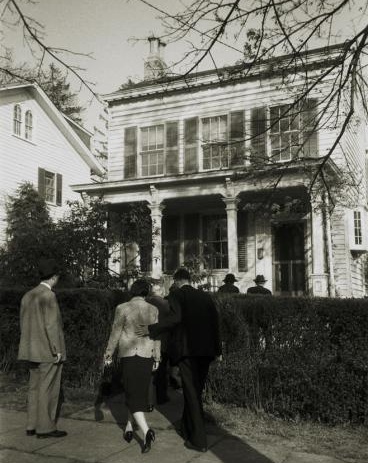 Mourners gather outside 112 Mercer Street, Princeton after the death of Albert Einstein in April, 1955. 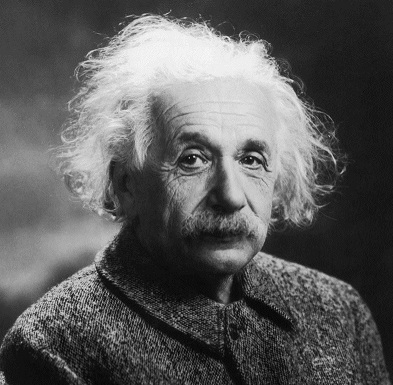 Albert Einstein's Annus Mirabilis, during which he published four papers including those pertaining to special relativity and E = mc², was in 1905 when Einstein was 26 years old. The most common isotope of Iron is ⁵⁶Fe. It's 26 protons and 30 neutrons combine to make iron incredibly stable by balancing the strong force (which binds protons together) and the electromagnetic force (which pushes them apart). Elements lighter than Iron can combine (fusion), whilst heavier elements can split apart (fission). But Iron, like the LORD, changes not (Mal 3:6), as explained by Professor Jim Al-Khalil in the BBC's ﻿Atom: The Key to the Cosmos﻿ (from 29 m 30 s). The first occurrence of 56 in pi begins from position 210, the 20th triangular number and the number of years the Israelites were in Egypt. The following two digits are 65. The atomic radius of Iron is 194 pm (Van der Waals). The first occurrence of 194 in pi begins from position 390, the gematria value of שמים ("heaven"). The following three digits are 151. Isaiah begins this chapter with "Arise, shine; for thy light is come, and the glory of the LORD is risen upon thee." (Isa 60:1-3). The first occurrence of 373 in pi is followed by the two digits 43. Beginning from position 373 in pi are the two digits 82. The number 373 is the 74th prime number. Of the great lights, the lesser light to rule the night is the moon, which orbits the earth at an average distance of 384,400 km. The first occurrence of 384400 in pi is followed by an interesting sequence of digits. 160913 is followed by 6117 (the gematria value of the "choose life" verse Deu 30:19) and 137 (the inverse of the fine structure constant). The sequence 160913 is more problematic. The first occurrence of 160913 in pi is followed by a remarkable sequence of rep digits, as well as their common divisor (37). The result of this method of subtraction is 101. The Hebrew word for "iron" is ברזל (barzel) which has a gematria value of 239. The first occurrence of 239 in pi begins from position 1688. The word "iron" appears 8 times in the Aramaic section of the Book of Daniel (Chapters 2-7). The first occurrence of 3737 in pi is followed by the five digits 67777. The totient of 3737 is 3600, which brings us back to the 17th triangular number: the number of fish caught in the net (Joh 21:11). The numerical value of "an hundred and fifty and three" (εκατον πεντηκοντατριων) is 2590. The first occurrence of 2590 is followed by those same four digits 3600. This is the first occurrence of 3600 in pi, beginning from position 358, which is the gematria value of משיח (Moshiach tr. "Messiah"). There are 360 degrees in a circle. 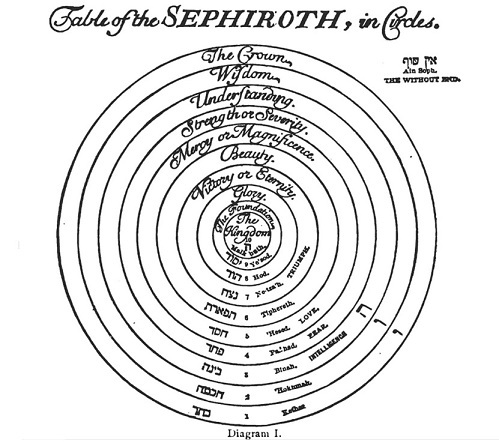 So 3600 is ten circles, as depicted in this representation of the ten sephirot from an early kabbalistic text. Illustration from Quabbalah: The Philosophical Writings of Solomon Ben Yehuda Ibn Gebirol, or Avicebron. First edition 1888. The area without the hexagon = 18, the gematria value of חי (chai tr. "life"). In very recent times, there have been largely erroneous claims regarding the significance of the number nineteen in the Qur'an (see analyses here and here). Notwithstanding, there are aspects of this number that are intriguing. 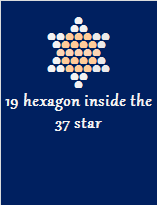 In accord with the 19 hexagon inside the 37 star, the first occurrence of 19 in pi begins from position 37. The first occurrence of 19 in e and phi begin from positions 108 and 188 respectively. The Creation of Eve by Michaelangelo Buonarotti. Fresco (1508 - 1512) Sistine Chapel, Vatican City. Adam said she shall be called Woman, because she was taken out of Man (Gen 2:23). The Hebrew word for "woman" is אשה (Ishshah) Strongs H802. The first occurrence of 780 in pi is followed by the three digits 499, the number of seconds for light to travel one astronomical unit (the average distance between the sun and the earth). אשה is also translated as "wife"
The product of 19 and 37 is 703. 703 is also the gematria value of "and the earth" from Gen 1:1. The 703rd word in the Bible is the יהוה (YHWH) when the LORD God caused a deep sleep to fall upon Adam, and he slept, and he took one of his ribs (Gen 2:21). The area without the star = 666. The gematria of אשמר ("Israel") is 541, and as if to confirm the connection, number 19 begins from position 541 in pi, immediately preceded by number 37. The number 541 is the 100th prime, and 10th star number. The 541 star and the 703 triangle are both 37 rows deep, and each have a perimeter count of 108. The 541 star and the 703 triangle share the same row height and perimeter count. The first chapter of Genesis records the six days of Creation. In verses 1-25, God created light, sky, land, plants, lights, fish, birds and land animals. Beginning from chapter 26 (the gematria value of the Tetragrammaton), God created man. The first occurrence of 43431 in pi begins from position 44,734. Often a date after the year 5000 on the Hebrew calendar will leave off five thousand. For example, the Hebrew year 5778 will be written as 778. To compute the Gregorian year, simply add 1240 to the shortened Hebrew year. For example, the Hebrew year 5778 corresponds with Gregorian year (778 + 1240 = 2018) . the 117th Hebrew word in the Bible is אלהים (Elohim) translated as "God"
the 317th Hebrew word in the Bible is טוב (towb) translated as "good"
The first occurrence of 129 in pi begins from position 499. The average distance from the sun to the earth (1 astronomical unit) is traversed in 499 seconds at the speed of light. The first "God" and "good" verse is Gen 1:4, when God saw the light, that it was good. The Hebrew word for "man" is איש (iysh) and for "woman" is אשה (ishshar). The words "man" and "woman" appear together in 74 Bible verses (KJV). The first 86 digits of pi (after the decimal point) sum to 418. The first occurrence of 418 in pi begins from position 727, and is followed by the three digits 159, then 813. The year 5778 on the Hebrew calendar corresponds with 1439 AH (Anno Hijri or the Islamic calendar). The first occurrence of 1439 in pi is followed by the fourth occurrence of the four digits digits 5600. The fifth occurrence of 5600 is surrounded on one side by the four digits 3627, and on the other side 112. Judges 2:20 - 3:6 addresses the reasons why the nations remained following the conquest of Canaan, instead of being driven out and delivered into the hands of Joshua. The first occurrence of 3627 in pi is followed by 516(7). "Whither will he go" (που ουτος μελλει πορευεσθαι) has a numerical value of 2590, a value shared by "an hundred and fifty and three" (εκατον πεντηκοντατριων) the number of fish caught in the net (Joh 21:11). The term "little sanctuary" (למקדש מעט) is, in the Jewish tradition, a reference to the origins of synagogues. The term למקדש מעט (mikdash me'at) has a gematria value of 593. Remarkably, the third occurrence of 3627 in pi is preceded by the sixth occurrence of 5778. Separating these first two occurrences of אור ("light") is the single word ויהי ("and there was"). This word, surrounded by "light", is the 26th Hebrew word in the Bible, and 26 is the gematria value of the Tetragrammaton (יהוה). The word אור ("light") has a gematria value of 207. The 207th word in the Bible is להאיר ("to give light") when God set (the two great lights) in the firmament of the heaven, to give light to the earth (Gen 1:17). The first occurrence of 207 in pi is followed by the three digits 222. The word "truth" appears in 222 Bible verses (KJV). This first appearance of 207 begins from position 2,373. The only word in the Bible with a numerical value of 2,373 is ευσχημονως ("honestly") from Romans 13:13 ("Let us walk honestly, as in the day..."). The gematria of the Tetragrammaton is 26, and 26th word in the Bible is ויהי meaning "and there was" or "and the". With a gematria value of 31, this word is surrounded by "light" (Gen 1:3). 31 is also the gematria value of the Hebrew word אל (El), meaning "God" or "mighty" but translated as God 213 times in the Bible. The first occurrence of 213 in pi begins from position 280. With a gematria of 31, the 280th word in the Bible is the same ויהי, which begins Gen 1:23 ("And the evening and the..."). Following this first occurrence of 213 in pi are the four digits 3936, which is the gematria value of Deu 5:3 (a reminder that God is with us, and not just a relic from the past). Immediately after feeding the multitude (Mat 15:39), Jesus sailed into the coasts of Magdala (μαγδαλα), birthplace of Mary the Magdalene. 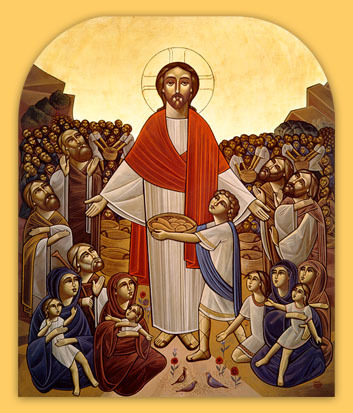 Christ Feeding the Multitude (Coptic icon). The first occurrence of 4000 in pi is preceded by the four digits 5778. Equally intriguing, beginning from position 4,000 in pi are the three digits 666. This is the third occurrence of 666 in pi. 3 x 666 = 1998, the gematria value of בראשית ברא אלהים את השמים ("In the beginning God created the heaven" from Gen 1:1. Physicist Richard Feynman famously spoke of the mystery of the number 137. Equally mysterious is the kabbalistic concept of 288 holy sparks. The first occurrence of 137 in pi is followed shortly thereafter by the number 288. The intermediate digits sum to 31, the gematria value of the 26th word in the Bible surrounded by "light". We have seen that the first two occurrences of the speed of light in pi indicate the "thousand three hundred and five and thirty" days referenced in Daniel 12:12. We have also seen that the time for light to travel 1 astronomical unit (the average distance between the sun and the earth) is 499 seconds. To recap, the first occurrence of 499 in pi begins from position 761. Beginning from position 499 in pi are the four digits 1298. Interestingly, the first occurrence of 1335 begins at position 12980. Later in Isaiah, God assured Zion that the Babylonian nightmare was over (Isa 52:1-6). The Hebrew word הנני (hineni), translated as "It is I", "Here I am" or "Here am I", is used elsewhere in the Bible by human beings responding to a divine call (e.g Gen 22:1, Exo 3:4). Only in the second section of the book of Isaiah is the term used by God addressing humans (also see Isa 52:6, 58:9). Besides this verse in Isaiah, the term "It is I" appears four times in the Bible (KJV), each spoken by Jesus, once in each of the four Gospels (Mat 14:27, Mar 6:50, Luk 24:39, Joh 6:20). The first occurrence of 115 in pi is preceded by the first occurrence of 873. The first ten verses of the Bible consist of 115 Hebrew words. Their combined gematria value is 24,575. The first occurrence of 24575 in pi is followed by the five digits 23888. Noah was a just man, and perfect in his generation (Gen 6:9). In this verse, the phrase "and Noah walked with God" is preceded by the Aleph Tav. The gematria of ישראל ("Israel") is 541, which is the 100th prime and 10th star number. The word "Israel" appears 2565 times in 2293 Bible verses (KJV). The first occurrence of 2565 in pi is followed by the three digits 179. The 179th verse in the Bible is Gen 7:19, when the tops of the mountains were covered by the waters of Noah's flood. Noah's father was Lamech, who was 182 years old when Noah was born (Gen 5:28-29). Jacob (יעקב), who became Israel, has a gematria value of 182. Lamech lived for 777 years (see the 137th verse in the Bible Gen 5:31). Lamech's father was Methusael (Gen 4:18), which means "man of God". Methusael (מתושאל) has a gematria value of 777. Isaac blessed Jacob in the Bible's 777th verse (Gen 28:3). Noah died in the year 2006 on the Hebrew calendar. The first occurrence of 1063 in pi is followed by the four digits 5188, then 99 which was the age of Abraham when he was circumcised in the flesh of his foreskin (see Gen 17:24). The days of Noah's life were nine hundred and fifty years. In the decimal digits of e, the first occurrence of 90050 is also followed by those same four digits 5188, as is the first occurrence of 9898 (see above). Isa 48:6 is verse number 18,621 in the Bible. Beginning from position 18621 in pi are the three digits 950 (the number of years in Noah's life). Position 950 in pi highlights the second occurrence of 5778, followed by 18, then another 5778. The 18th Hebrew word in the Bible is merachefet, or "moved upon" (מרחפת), which is the origin of the Jewish tradition of 288 Holy Sparks. There are three mentions of "Noah" in the New Testament, including the Bible's 58th book (Heb 11:7). On another five occasions, "Noah" is referred to as "Noe". Νωε ("Noe") has a numerical value of 855. Beginning from position 855 in pi are the three digits 000, then 3137. Mat 24:37 is the 10,111st verse in the Bible. Ten thousand, and 111 are highly evocative. When spelled, the first letter in the Hebrew alphabet, אלף (aleph) has a gematria value of 111 and literally means "thousand". Arguably the most convincing ELS code in the Bible is a sequence of ten alephs, which occurs in the Book of Genesis with an ELS skip of 1850. 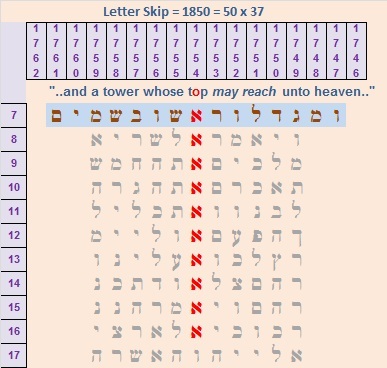 Remarkably, the tenth aleph is the middle letter of the word ראש (rosh), which means "top", when the men of Babel said: Go to, let us build us a city and a tower, whose top may reach unto heaven; (Gen 11:4). The tower of alephs, whose top may reach unto heaven. In the Revelation of John, there are four mentions of the number 144. There are 144,000 marked with the seal of God (twelve thousand from each of the twelve tribes of Israel) in Rev 7:4, 14:1, 14:3, and the wall of the New Jerusalem was 144 cubits (Rev 21:17). The 441st Hebrew word in the Bible is אלהים (Elohim) when, on the seventh day, God rested from his work (Gen 2:2). The first sabbath followed six days (144 hours) of creation. Preceding this first occurrence of 702 in pi are the three digits 190, which begin from position 541 (Israel). In the 190th verse in the Bible, after forty days, Noah opened the window of the ark (Gen 8:6). In this verse, ונפקחו ("opened") is the 822nd word in the Bible. The first occurrence of 822 in pi is followed by the two digits 31 which begin from position 137. The world's highest residential building topped out on October 10, 2014 (the second day of the Sukkot festival). Located at 432 Park Avenue, this monument to the super-wealthy dominates the New York city skyline with a height of 1396 feet. The house that inequality built - 432 Park Avenue. Reaching for the heaven, 432 Park Avenue has 96 stories. Just as there are five mentions of "Noe" in the Bible, so can 432 Park Avenue be seen from all five burroughs of New York City. Apartment price tags ensure that only the super wealthy will have the opportunity to take up residence. The Wealth-X and UBS Billionaires Census of 2017 counts 2,754 people with more than a billion dollars in assets. With assets of US$9.2 trillion, this is the highest number of billionaires ever recorded. The increasing wealth inequality is in flagrant disregard of the teaching of the Bible. The feeding of the multitude has been abandoned in favor of the feathering of the nests. In 2014, the CEO to worker pay ratio was 373:1 (see earlier for the significance of that number). The average S&P 500 Index CEO received US$13.5 million in total compensation. The first verse in the Bible ("In the beginning...") has a gematria value of 2701. God's creation was subsequently wiped out in the flood, and a new beginning commenced with a microcosm saved in the Ark after the earth dried. Coincidentally, this verse signalling the new beginning also has a gematria value of 2701. The ten alephs in the Tower of Babel ELS have a total gematria value of 10 x 111 = 1110. This is the gematria value of a Bible verse when Jacob answered God's call with Hineni ("Here am I"). The first occurrences of the numbers 957 and 896 in pi both overlap the four digits 5778. On the Hebrew calendar, the year 5778 corresponds with 2017/2018 on the Gregorian calendar. Heads up billionaires: bypass the opportunity to purchase an apartment at 432 Park Avenue. Feed the multitude instead - that would truly be reaching for heaven. The phrase "LORD God of Heaven" appears in four Bible verses (KJV), once for each letter of the Tetragrammaton. In Hebrew יהוה אלהי השמים ("LORD God of Heaven") has a gematria value of 467. The first occurrence of 467 in pi begins from position 582. In a stunning coincidence, the word "heaven" appears 582 times in the Bible (KJV). In the Hebrew Bible, the first 42 verses consists of 582 words. The 42 letter Name of God is composed from a sequence of seven letters that are corresponded to the seven days of the week. It's interesting that the first occurrence of "LORD God of heaven" should appear in Gen 24:7 (7 days of 24 hours in common usage). The Tetragrammaton (יהוה) appears in 5195 verses in the Hebrew Bible. The first occurrence of 5195 in pi overlaps the remarkable 5778185778 sequence. 5778 on the Hebrew calendar corresponds with 2017/2018 Gregorian, whilst 18 is the gematria value of חי (chai) meaning "life". The first occurrence of 18 in pi is followed by 6117, the gematria of the Bible's "choose life" verse (Deu 30:19). The word "God" appears in 3876 verses in the Bible (KJV). The first occurrence of 3876 overlaps 6117. 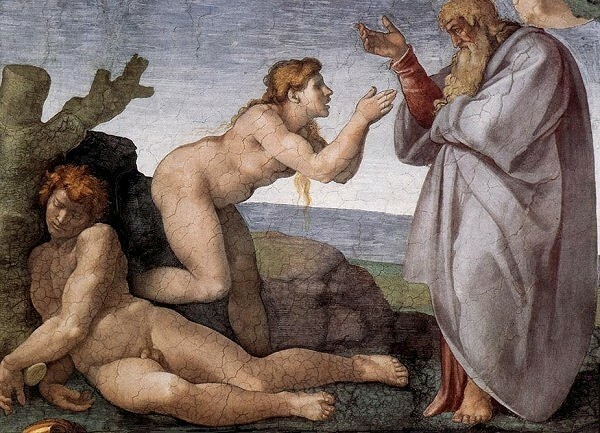 The 339th word in the Bible is את (Aleph Tav), surrounded by אלהים (Elohim) on one side, and אדם (Adam) on the other, when God created man in his own image (Gen 1:27). the 339th word in the Bible is the 3rd word in the 3³rd verse. The Tetragrammaton (יהוה) appears 6007 times in 5195 Bible verses. The first occurrence of 6007 in pi is followed by the two digits 23. 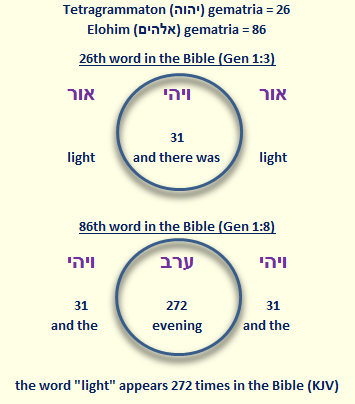 The 23rd word in the Bible is אלהים (Elohim) when God said, Let there be light, and there was light (Gen 1:3). It could equally be said that 6007 is followed by the three digits 230. Coincidentally, the 230th word in the Bible is also אלהים (Elohim) in Gen 1:20.